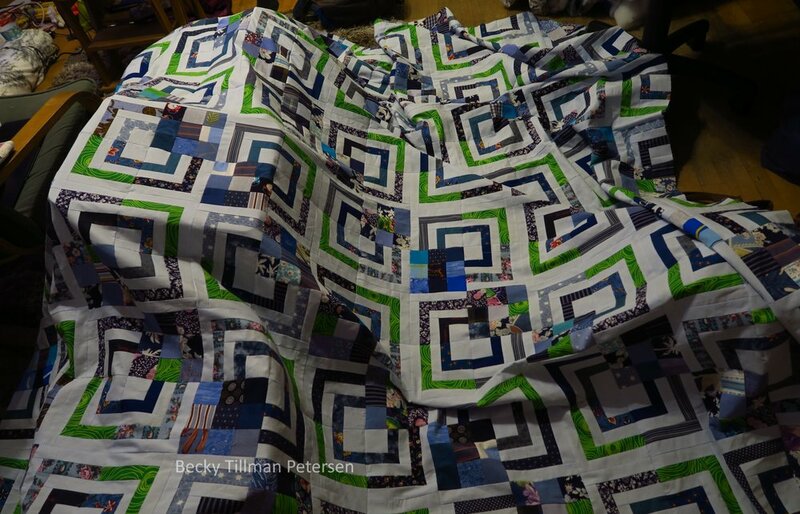 I am finally winding down this project - it's not done yet - but I'm definitely on the last of it! It is a variation of the Bento Box design. I really debated making this into that. However, I decided that I wanted a rest for the eyes and not all that craziness. While I admit to liking the Bento Box design, it wasn't what I wanted here. I also wanted to spice it up with a bit of green. I hadn't actually thought it through that if I made the green on the same place in every block that it would end up with the rail fence look. That surprised me, actually. because I had thought because of the twist and turn of the blocks, that there would be a bit more randomness to the greens. That background is not white or off white. It is light blue. A very pale blue. I had just enough for this top. Exactly enough. It was almost miraculous how it worked out (it was a duvet cover). Obviously I hadn't planned it that closely - I thought I had plenty and to spare. In the end, if necessary, I was prepared to sew together some scrap pieces to get my last few logs out of it - but I didn't need to do that. But it's fine as it is. It would also be fine in random places. I used this same green duvet cover in Triple Irish Delight and it played a role in Double Star Beauty as well. Yes, I'm almost out of it. Here's the pattern. I hope someone can use it! As I'm drawing to a close with this project, there are happy/sad thoughts. One one hand, you will be getting more of a break from these "blue" posts but on the other hand, that leaves me more time to think about variety - which I like! 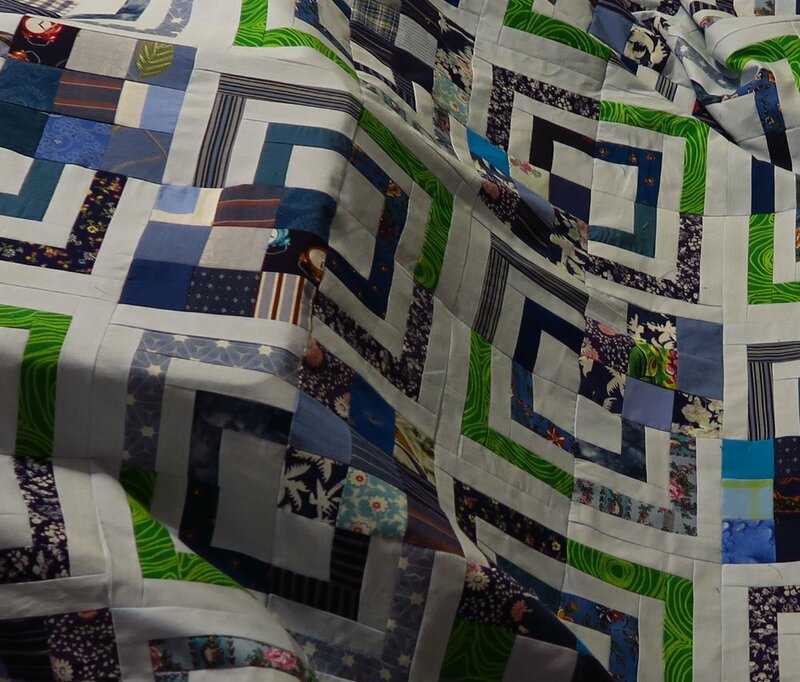 I've been working on this project since the first part of November as I showed the first quilt on November 15. So it's been a while. I'm psyched up for other things about now. I've got some gifts to finish up - not they aren't Christmas, or birthday, or any special gifts, they are "just because" type of things. I trust this finds you having a great one wherever you are! Stay warm if you are in the northern hemisphere, and stay cool if you are reading from the southern hemisphere! Don't forget to check out the goodies my sis has for you!